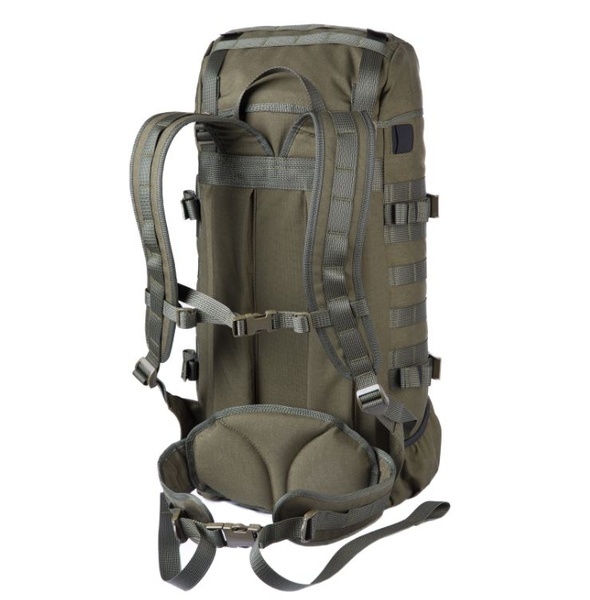 The Jaeger backpack is an improved model of the Light Border Patrol backpack originally designed for the Finnish Border Guard. Genuine user experiences have been taken into account in the design of the backpack and the best of the many ideas have been sewn together to make the Jaeger. 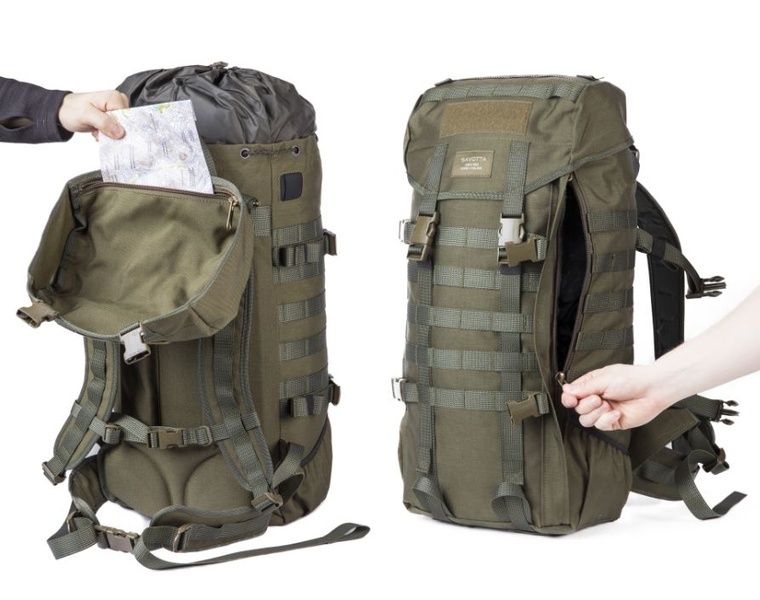 The Jaeger is more than a normal daypack. The many details and extensive MOLLE webbing make the backpack a truly modular and versatile tool. Due to its slim shape, the backpack will not be in the way even in cramped spaces and is ideal for skiing and hunting. In its size category, the Jaeger is a sturdy backpack to carry. The internal support frame holds the Jaeger firmly in shape. With the compression straps of the bag, even a pack that is not full can be tightened so that it sits firmly and does not jiggle around. The actual bag of the Jaeger backpack (dimensions approximately 52 x 25 x 17 cm) has been designed to be slim but still spacious enough to hold the necessary supplies for a day trip. The opening of the bag is closed with a drawstring and secured with a waterproof protective collar which enables overpacking as well. The opening is covered with a flap which hugs the top of the backpack and is secured with straps. The flap has been attached with adjustable straps from both sides, so it “floats” and enables easy overpacking. If necessary, the generous length of the straps provides a lot of space under the flap for extra supplies, such as a sleeping bag. Furthermore, there is a spacious zippered pocket for valuables inside the flap (dimensions approximately 25 x 25 cm). Jaeger would not be Jaeger without the modular structure provided by PALS webbing familiarly known as “MOLLE”. By applying this technology, the Jaeger backpack has been made into a cutting edge modular package. 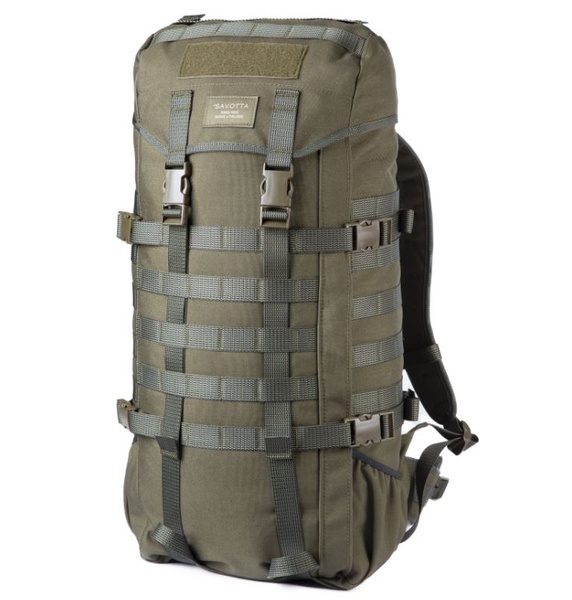 MOLLE webbing can be found on the front, sides, flap and even the shoulder straps and hip belt of the Jaeger. With MOLLE, you can attach any pocket compatible with PALS almost anywhere you want on the Jaeger. By means of suitable pockets, the Jaeger backpack can be expanded into, for example, a compact anatomical rucksack. In addition to the modular attachment possibilities, the MOLLE webbing reinforces and stabilises the backpack. 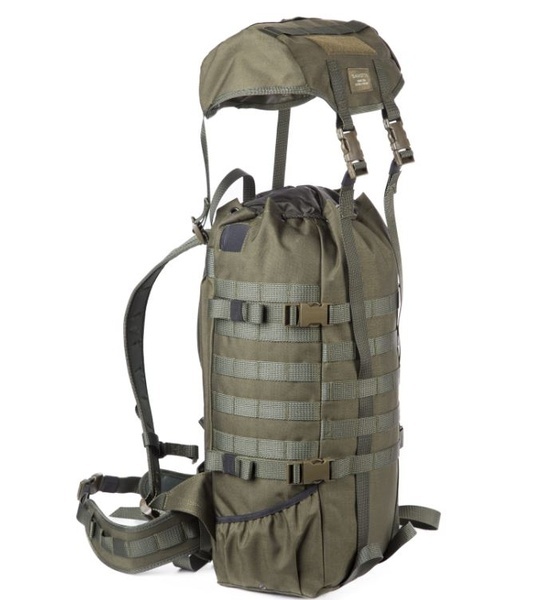 One MOLLE loop on the Jaeger backpack can bear over 100 kg of weight. On the front side of the Jaeger at the bottom of the bag you can find attachment loops (2 pcs) for the transport of loose equipment. The loops have been sized to be long enough to suit the carrying of exceptionally long pieces of equipment so that the shaft fits into the loop, if necessary. The back has been reinforced with a highly durable frame made of ethylene plastic sheet. Because of this lightweight frame, the backpack stays upright and is comfortable to carry even with a load that is a bit heavier. The support frame can also be removed from the backpack, if desired. As an optional extra, a more rigid version of the frame is available for the Jaeger backpack in which two vertical aluminium rods have been attached to ethylene sheet with rivets to stiffen it. A Jaeger backpack equipped with the extra frame is already a small ergonomic rucksack. The generously sized and sturdy padding pillows against the back are a rarity in a backpack of this size category and make the Jaeger a surprisingly comfortable small backpack to carry. If desired, the pillow against the small of your back can be removed or, alternatively, the hip belt can be folded out of the way behind the pillow. Bag capacity when the backpack is closed: approximately 22 l.
Purchase through PayPal by using the "Add To Cart" button above or use the form below to order the Savotta Finnish Jaakari Backpack . Feel free to contact us if you have any questions about the Savotta Finnish Jaakari Backpack .